Isn't it really just a high tech version of Tron with martial arts and guns? It is well known that The Matrix is considered a masterpiece of filmmaking. Well I never got it. I never thought this film was great, or even really liked it. I can't say I hate it, I just never really thought it was any good. Thomas Anderson, who's hacker alias is Neo, is a computer programmer who has a feeling that he doesn't belong. He eventually gets found by a mysterious group of hackers, who believe he is the one. Eventually Neo discovers that the world really is a computer simulation, and then is exposed to the real world. He finds that the human race is near it's extinction and enslaved by machines. The human race is being used to power all of the machines and is kept in the matrix. To be honest even writing this summary of this story shows that this entire is not original at all. It uses the same machines against the humans story that has been used to death. Terminator (and its never ending sequels), I Robot, Blade Runner, 2001: A Space Odyssey, WarGames and many more. All work on the idea that machines are doing something that endangers mankind. This is not an original idea! Hell it was even used in the TV series (and the horrible film) of Lost In Space, with the robot programmed to destroy the ship. Personally I don't think any aspect of this film is original in anyway, except maybe one. The original idea of putting all of these unoriginal ideas together. In essence The Matrix is a remake of Tron, although done a bit better. The story is just the same old tale with there being only one person who can save us all, sounds awfully like Tron who fights for the users. They both share the same concept of moving between the digital and real worlds, the difference here is what we percieve as the real world is in fact the digital one. 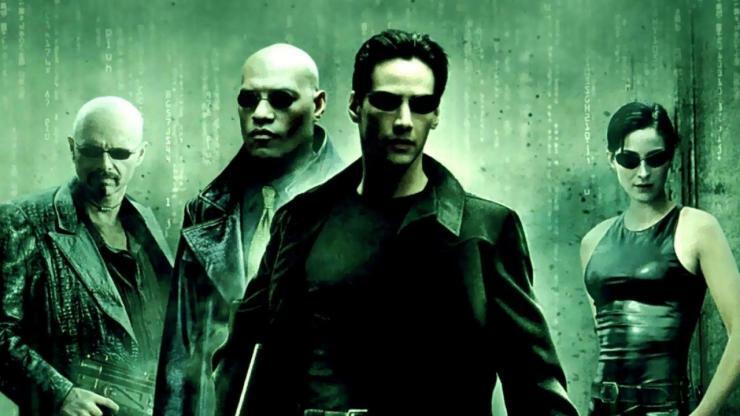 In both films there have to battle a digital entity that plans to take over the world or (in the case of The Matrix) wipe out the remaining resistance. And mix in a whole bunch of far from subtle Alice in Wonderland references. How does anyone think this film is original? The action, which I will say is very well done and probably the film's saving grace, is far from original. All it does is combine the styles of all known action styles used by Bruce Lee & Jackie Chan, but with modern twists and slow motion that was using a John Woo-style (this was very popular at the end of the ninties) whilst also ripping off tonnes of anime. But that isn't enough to carry a two hour film. The acting in this film is also terrible. Keanu Reeves seems permanently stoned throughout the whole film (maybe his whole career thinking about it), there doesn't seem to be any different expression in his face. Carrie-Anne Moss, who I would normally say is a good actress, just stands around with the same expression on her face (that is when she isn't fighting everyone). The only good performance in my opinion is Laurence Fishburne. He plays the Obi-Wan style character, and it kind of works throughout the film. His character basically explains everything that is going on in the film. That is his sole purpose until he gets captured, then he becomes the one Neo has to rescue. The real reason why this was so popular when it came out was it had no hype. Warner Bros didn't really bother hyping it up as it was released the summer that Star Wars Episode 1: The Phantom Menace was released. Everyone and everything was focused on that film. The Matrix and The Mummy found an audience simply because everyone was fed up with Star Wars (or were very disappointed with it) and wanted to see something different. That and it tries to act really cool with the shades and black leather. For me though I found it was a kind of forgettable experience with just about everything you had seen before done in a slightly different way. Certainly not the revolution of modern cinema that people say it is.